Born on 12 April 1886 in Geecross[? ], Hyde, England - son of James Wilson, Geecross[? ], Hyde, England - at the time of his enlistment in 1915: trade as iron molder; single; currently a member of the active militia (no details provided); no previous military service; Methodist; height of 5 feet 7.5 inches; chest of 34 inches fully expanded; dark complexion; brown eyes; black hair. 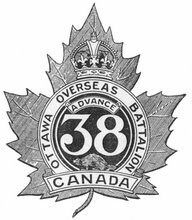 Joined the 35th Battalion, CEF, in Toronto, Ontario, on 5 April 1915 (number 405522) - taken on the strength of the 38th Battalion, CEF, on 29 or 30 March 1918 - struck off the strength of the 38th Battalion on 16 June 1919.